Ask the property directly the rate for 4 people. 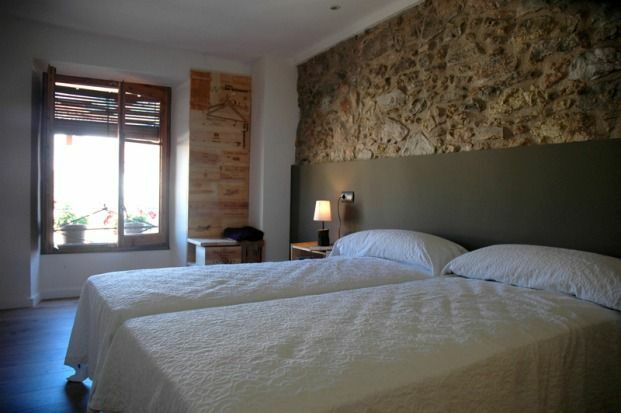 Cal Benito, is a house located in the Priorat region, in the middle of the town of Capçanes (450 inhabitants) and surrounded by a wonderful natural environment. Its construction is supposed to be the origin of a town built on the rock of the hill. At the moment some details of the original construction have been restored, singular elements have been incorporated that recall the old town houses, and that has configured a comfortable and cozy home, with a wide unique dining space - kitchen - dining room, a singular interior garden " entrecases ", and a terrace from where you can contemplate the vineyards and surrounding mountains declared" protected natural space ". The fact of being located in the middle of Capçanes (of economic activity centered on viticulture) is a reason to approach rural life and the protagonists of a small and medium-sized town of nature, but alive and with a future. We stayed 2 families (9 in total) in Cal Benito with kids from 2 to 9 years old. There was plenty of room on the 4 floors and the outside space for everybody. Everything was very need, tidy and clean. I can only highly recommend this house to anyone! Most wonderful experience in Catalonia! We were a family of 6 (2 grandparents, 2 parents and 2 children) who stayed at Cal Benito in September. We were very comfortable in this beautifully redone and immaculately clean home in Capcanes. I cannot say enough about the owners - they treated us as is we were family members and went out of their way to ensure we had a lovely experience in the Priorat wine region. The town of Capcanes is very quaint and the perfect home base for wine lovers to visit the area. We enjoyed the non-touristic feeling of the town and its 2 local bars as well as the very nice public pool. We enjoyed eating our dinners outside in the beautifully landscaped garden area as well as visiting restaurants in near-by towns. I would stay here again if visiting this area and would wholeheartedly recommend Cal Benito to family and friends.